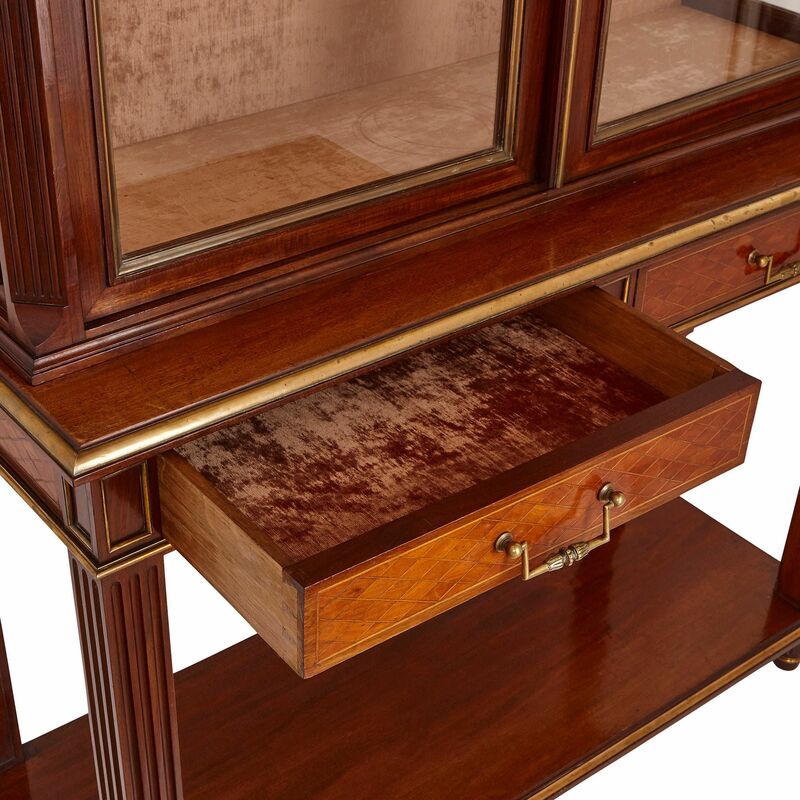 These ingenious mahogany vitrine consoles have been designed so that they can come apart to function as tables and cabinets, independent of one another. The two vitrine-consoles are prime examples of ‘metamorphic furniture’ — that is, items which were crafted to be multi-functional. 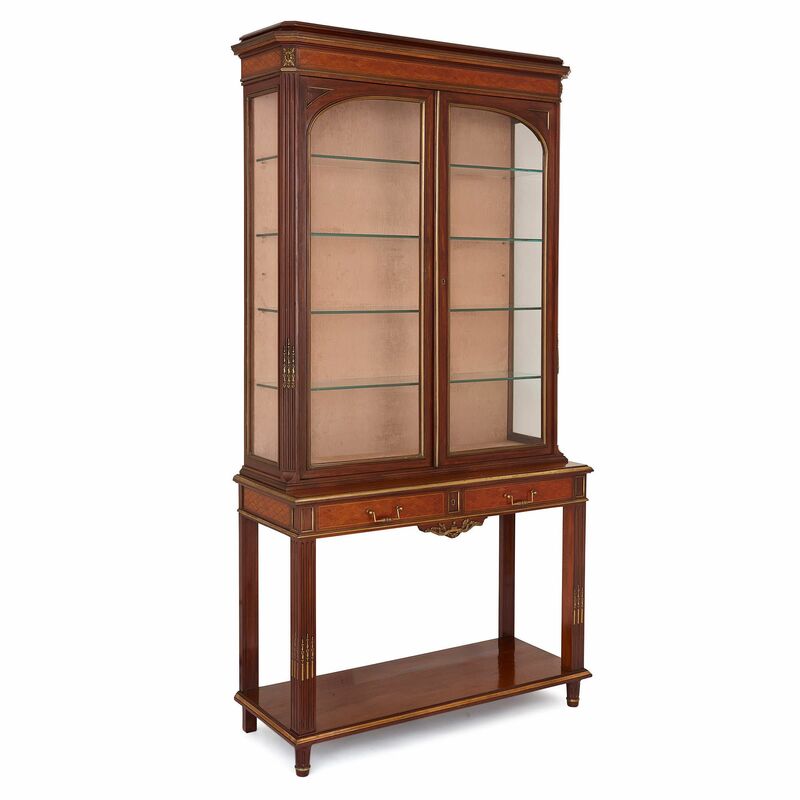 This type of furniture was especially fashionable in the 18th Century. Metamorphic items not only saved space, but demonstrated ingenuity in design. 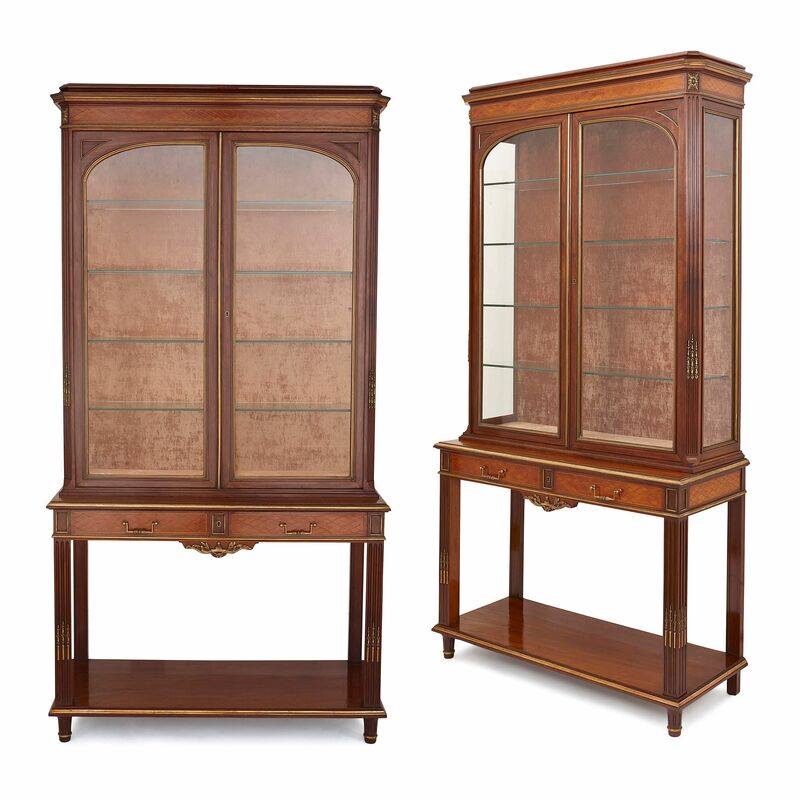 These works comprise a pair of vitrines (open display cabinets) that fit onto a pair of console tables. The vitrine tops can be removed from the console tables below, enabling each piece to serve as either one or two pieces of furniture. 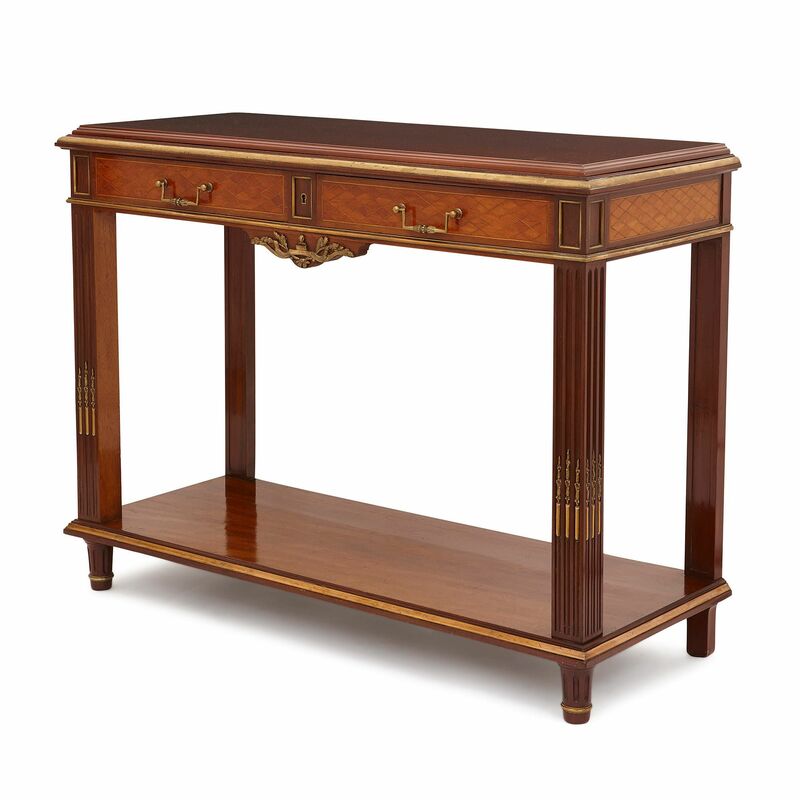 The mahogany console tables each stand on four, straight fluted legs, the front two of which are mounted with ormolu, fruiting foliate forms. 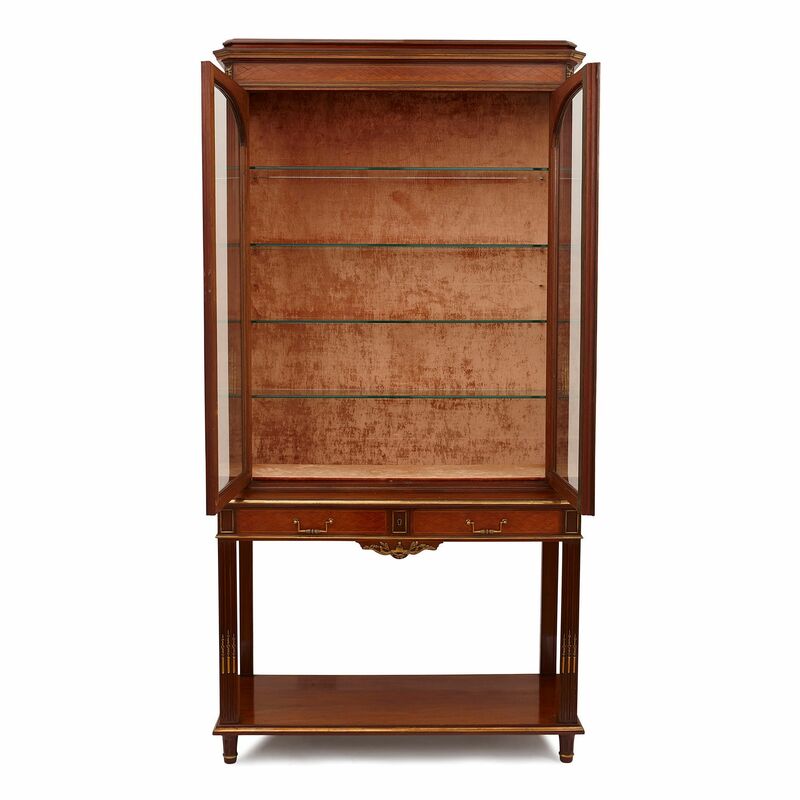 The legs support a lower shelf, which is outlined by an ormolu border. Each table is further decorated above with a diamond-shaped parquetry frieze, which continues around the piece, articulated on its top and bottom by an ormolu cornice. 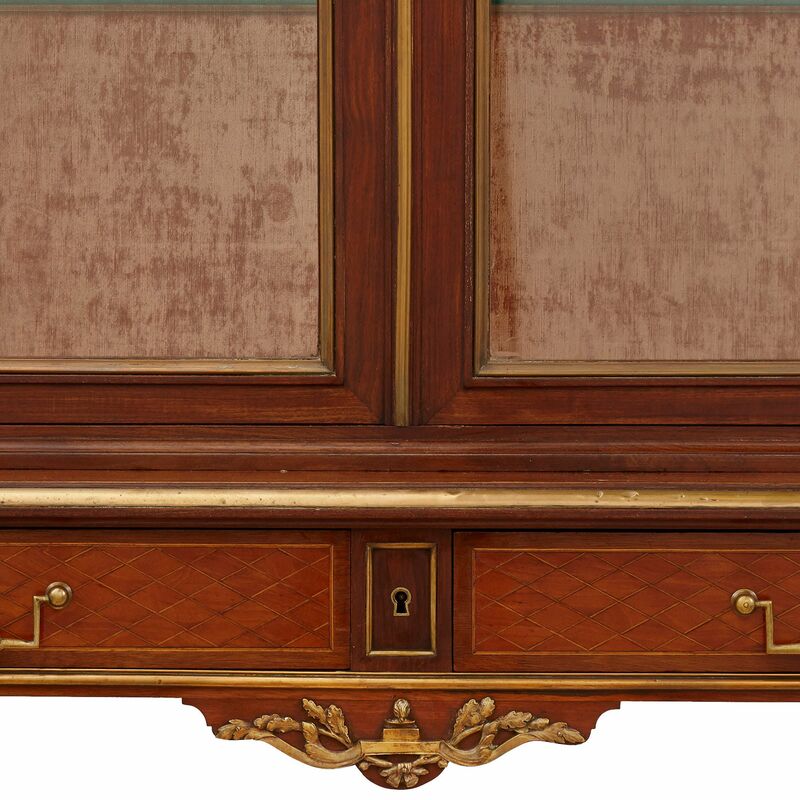 Two velvet-lined drawers, with geometric ormolu handles, are concealed within the front section of the parquetry panel. Below, the tables each feature a small, shaped apron, which is mounted with a foliate ormolu pattern. The two vitrines are similarly decorated to the console tables, being constructed in mahogany and detailed with ormolu mounts and parquetry panels. 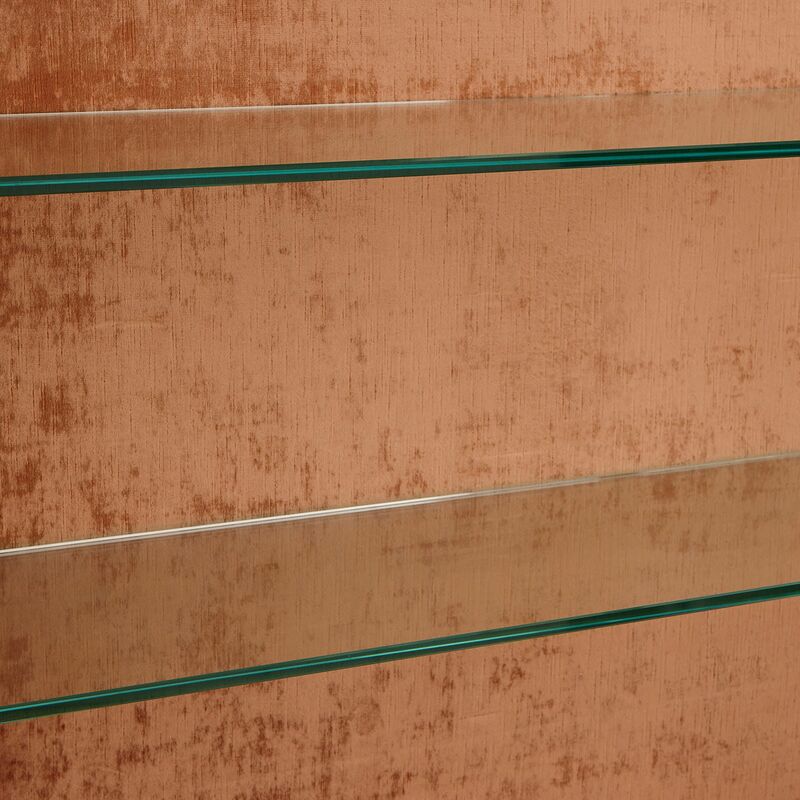 Each has four glass shelves, set against a light orange-red velvet back panel. 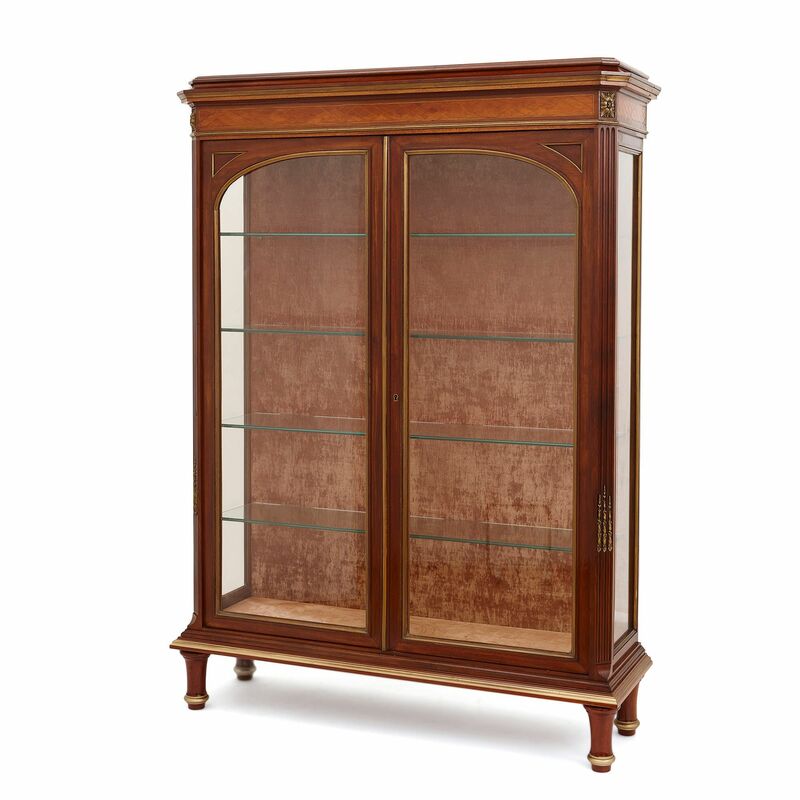 These shelves are contained within glazed mahogany cases, formed of smooth panelled frames with fluted, ormolu-mounted corners. The glazed panels and mahogany arch spandrels are highlighted in ormolu. 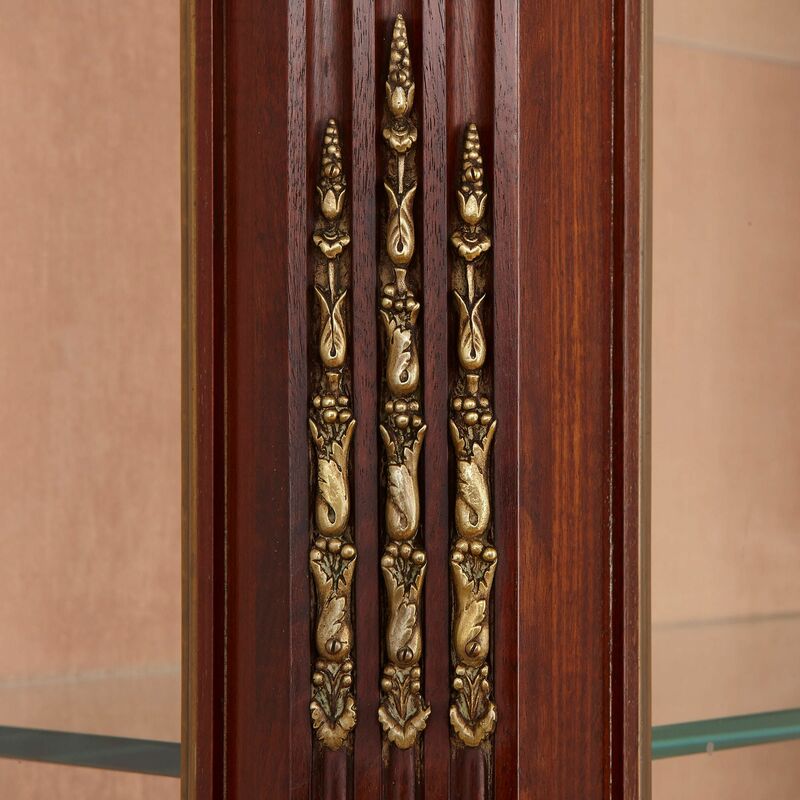 Each piece is topped by a parquetry frieze, set with an ormolu frame and mounted with ormolu rosettes on its corners. Each frieze is topped by a shaped, ormolu-rimmed roofline, which is architectural in character.